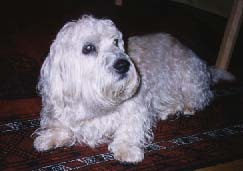 I have been a Dandie Dinmont Terrier owner since May 1977. My first dog was called Hampus (alias SUCH Klasse). He was a source of joy for an all too brief time - he passed away in September 1983 due to a fatal slipped disc. Hampus was followed by Rasmus (b. 27th July 1983; pedigree name: Willows' Merveille), who was an absolutely fabulous dog. Sadly, on 11th January 1998, Rasmus passed away quietly and undramatically in his sleep, aged 14 years and 5 months. I miss him very much, but my happy memories of him will always remain in my heart. For a tribute to Rasmus, click here. After a fair deal of soul searching, we decided to get another Dandie Dinmont. We got our new puppy on 28th February, 1998. His name is Kasper. Read a text about Kasper and Rasmus called "Cotton and Wool"
Dandie Dinmont Terrier isn't the most well-known breed, but without any doubt it is the no.1 breed, in my opinion. Perhaps it is a blessing that the breed hasn't gained mega-fame-status, as this way it has managed to maintain its unique character. The name of the breed hails from a book called "Guy Mannering" written by Sir Walter Scott, perhaps most well-known for being the author of "Ivanhoe". In "Guy Mannering", one of the characters is a Scottish farmer who is called Dandie Dinmont and who has "pepper and mustard terriers". After this book was released way back when, the breed was re-named Dandie Dinmont Terriers. If you are a Swede and wish to find out more about Dandie Dinmont Terriers, I can highly recommend Jonas Wiborg's excellent book "Terrierna från Charlieshope" and also the new Dandie Dinmont Club homepage. Gollnes Kennel (Sweden) - NEW!! Wimlett's Kennel (Sweden) - NEW!! Toftir Kennel (Finland) - NEW!! See what Dog Lovers' Bookshop has on Dandie Dinmont Terriers.